Style Hunters Mar and Paul go up against the competitive husband and wife team of Ian and Amanda. Each team is given a $500 budget to find, fix-up and flip items purchased at the Brimfield Antique Show in Brimfield, Massachusetts. They'll have only one hour to hunt and haggle for bargains, as they shop for projects featuring industrial design, color theory, and transforming an "ugly duckling" piece. Both teams then get to work fixing up their finds in the workshop, in the hopes of raking in the dough at NYC's Antiques Garage. One team transforms an antique carriage wheel into a massive wall clock, but will it turn a tidy profit? The team that makes the most off their pieces wins $5000. Hosted by Designer/Flea Market maven and Good Morning America Co-Anchor Lara Spencer. Experienced style hunters go up against a confident husband and wife team. 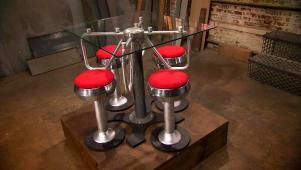 From: Flea Market Flip with It's About Flipping Time!